Having a HTPC set up at home brought me to look at several mouse/keyboard solutions. I first started with a wireless set from Logitech, but having a full size keyboard in our living room wasn’t that nice, so I started looking for smaller devices. 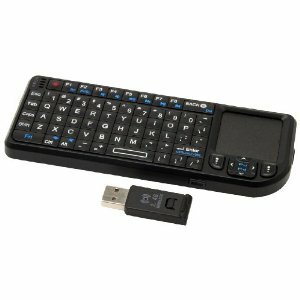 The first one I found was the VisionTek Candyboard Bluetooth Mini Keyboard ($40 on Amazon). This is a very nice keyboard, well finished and very small… it is really and candyboard! I bought the Bluetooth version, which is quite handy since you can connect it to any Bluetooth devices (computers and game consoles). Unfortunately, after just a few months my 1 year old son climbed on my HTPC and totally broke the Bluetooth USB extender into pieces. So, instead of buying a new extender, I bought a second keyboard for almost the same price ;). 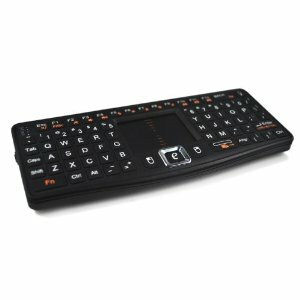 This time I got the Rii Touch N7 Mini Keyboard ($40 on Amazon as well), which is the 2011 version of this type of mini keyboards (same manufacturer). The N7 is a standard 2.4GHz radio keyboard, and is really well suited for a home use. This time, it provides a split keyboard which is a lot easier to use for the size of the keyboard. Again here, you can change the orientation of the touchpad (not as handy with the split keyboard) and it also provides a virtual scroll wheel and few shortcuts that are very usefull for a HTPC use. Overall, both keyboards are nice, small and cheap devices. They are well suited for an HTPC use where you don’t need a keyboard too often (I still have my Wireless Logitech VX Nano mouse around :)). The only drawback I see with those devices is the operating range. Either Bluetooth or long distance radio provides the same result, after 3 meters don’t expect a perfect experience, but it still makes the job and since I don’t have a huge TV anyway, both work fairly well for me. I use the Rii N7 at home and I keep the VisionTek Candyboard in my laptop bag (using my laptop built-in Bluetooth) in case of presentation. Spot on with this write-up, I actually assume this web site needs far more consideration. I?ll probably be once more to read much more, thanks for that info.